Scale Aviation Modeller International likes both sheets: “Two new decal sheets from this Hawaiian based company following on from their debut sheet covering the American version of the V-l Flying Bomb. The new sheet supplies a selection of Kuomintang roundels. This insignia has been used since 1924 by Chinese Nationalists Air Force or as it is more normally known in the west, Taiwan. 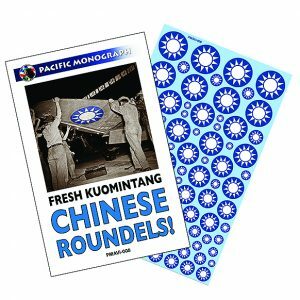 “The decal supplies identical markings with the white sun of a blue roundel in 10 sizes. The instructions give you a guide showing which roundel you need in 1/72,1/48 and 1/32 scale. The largest size roundel in 1/72 scale equals a 72-inch roundel on a real aircraft and if used on a 1/32 scale model it will become a 32-inch roundel. “The reason why you have two sheets is that one is described as Fresh and shows the marking in a royal blue colour as applied in the factory when new. “While the second sheets is called Not So Fresh and shows the markings in a light blue paint that recreates a faded finish as seen on period photographs of aircraft which spend most of their lives stored outside. “These sheets supply 90 roundels in 10 sizes.